Everyone loves a birthday card in the mail. This birthday soiree card will make anyone swoon with a feeling of how loved they are! 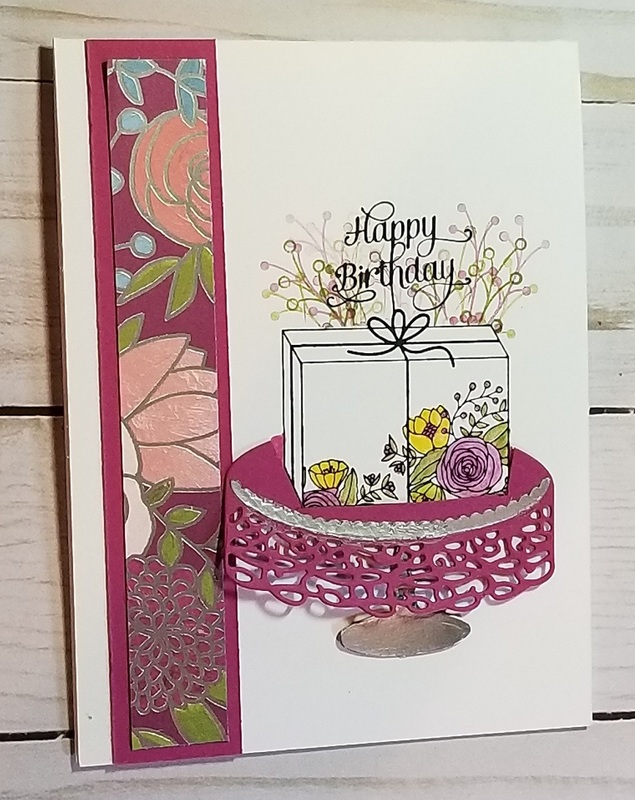 This simple and elegant card is quick to make for that last minute (I need a card NOW) birthday that pops up unexpectedly. Adhere DSP 5 ¼”x ¾” to BB 5 ½”x1” with the snail, adhere to card base ¼” from left fold. About half-way up from the bottom – use Basic Black ink to stamp the Present. Stamp again on Post-It & fussy cut for masking. Stamp sentiment just above the present within the bow – in Basic Black ink. Use blender pen to touch the ink pad (swipe once on scratch paper) to color the flowers. Clean blender pen between colors by swiping on scratch paper till clear swipe. Use the mask of the present to do a cut out on the cake plate so the present looks like it is sitting on it. Carefully, leaving little flaps that will appear to sit behind the present, they can be trimmed to fit. use a glue dot to adhere the base to underside of the cake plate, adhere the cake plate with dimensionals around the present. Trim your edges near the back of present.